The new-look lobby at Novotel Sydney International Airport. Accor has rebranded the former Mercure Sydney International Airport as a Novotel following a multimillion-dollar upgrade. Upgrades to the property were carried out on all guest rooms, with blackout curtains installed along with double-glazed windows to further reduce noise. Rooms and public spaces have been adorned with a botanical theme consisting of wallpaper and wooden accents. The project was carried out with the help of WMK Architects. General Manager, Zayne Boon, said the company was delighted to continue operating the hotel under the Novotel name – the brand being known for its midscale, multi-service offering. 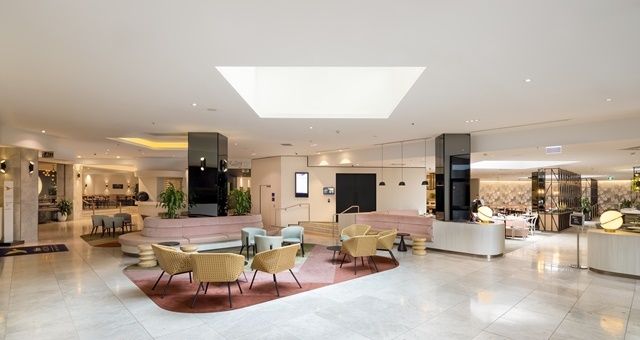 “In conjunction with an extensive renovation, we saw an opportunity to further leverage the Novotel brand’s presence around the Sydney Airport precinct, and we are excited to welcome guests and showcase the refreshed hotel from today,” Boon said. The hotel restaurant has also been enhanced with a new menu set to launch soon which will deliver a paddock-to-plate concept focused on promoting and serving locally-sourced Australian produce.